Dive into the realms of a fantasy axe never before experienced! Featuring two solid cold hard stainless steel axe heads surrounding outstretched metal spikes and cold cast poly resin skull face. The aluminum shaft is constructed with cast metal accents and a wire wrapped grip. Includes hardwood wall plaque. 24 3/8 in. overall. This is a great axe. It is very sturdy and came a lot sharper than I expected! I was able to chop through a tree right out of the box! After doing this the axe was still completely sturdy. Beautifully made blade, handle and plaque. EXTREAMELY sharp at the blade edges, but needs sharpening on the actual blade, my friend even accidentally cut himself when he held it cause the blade edges where just that sharp, don't worry, he is fine. Overall, wonderful craftsmanship and design, could be a bit longer, but that changes nothing about my opinion, 5 stars. Bad A** It looks like something a barbarian would carry. It just looks terrifying. The edges of the axe head are sharp and so is that spike. I don't know what practical purpose this axe has but any one buying it, probably isn't planning on going backpacking with it either. 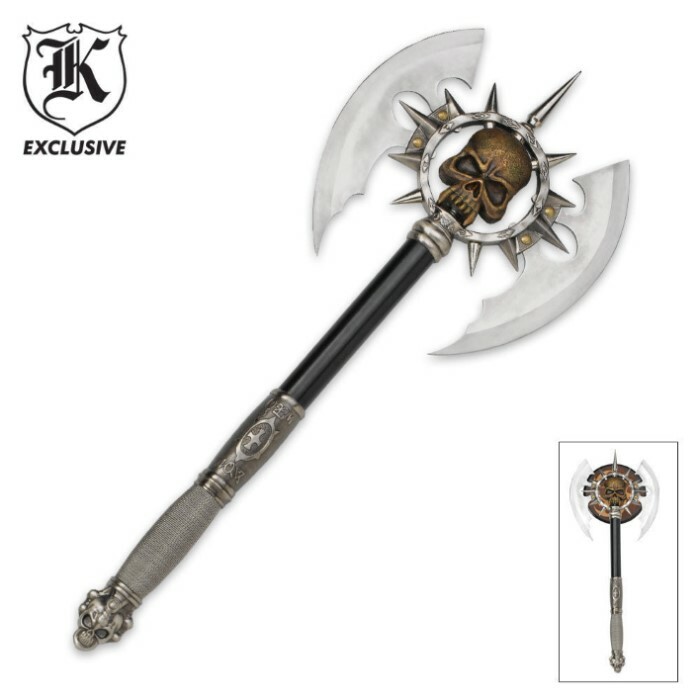 I only wish list is that the handle be bit longer 6" - 8" maybe? Well worth the price however. This axe looks and feels great, awesome....I like the design which makes it look fierce. Overall I'd give it a 5/5 if didn't come in the mail with the top spike being bent! Because of this minor issue I give it a 3/5. I was very pleased and surprised when I received this. The weight is perfect, great handle for gripping and it looks great. The detail is much better than the picture shows...I highly recommend this. I have to say this is one of my best purchases, especially considering the price! I think it looks better than the illustration. it's sturdy, heavy, sharp, deadly, great detail... basically exceeded my expectations in every way. I've used it in two photo shoots already and it photographs GREAT. Everyone that sees it is either scared or wants to take it down and start lopping off goblin heads or something haha It's great. As always, trueswords price and service seem to be the best!